When I read about the release of this latest installment of “A Getting to Mr. Right” series by Carol Balawyder, I hurried to order my copy. When I received it, I put aside the book I was reading to start right in and I was glad I did. I thoroughly enjoyed this novelette. In fact, there are so many good things to recommend about this story that I decided to give it the 12 Days of Reading treatment. Day Two of Reading – Early in the story, Campbell quits her job and spends much time thinking about her next career move. She doesn’t bow to her husband’s pressure to “find a job, already.” Courage and self-love lead her to the career opportunity that makes her heart sizzle, reminding me that discontent is a symptom; investigate the root cause. Day Three of Reading – The other series characters, Felicity, Missi and Suzy, make guest appearances in this story. What a treat to read about the updates in their lives; what a treasure to be reunited with them even for a short time. Day Four of Reading – Like real people, even fictional characters live with regrets and bad decisions. Campbell does but she engages in an annual ritual whereby she acknowledges the mistake while honoring the person she has evolved into. I thought this a healthy, freeing ritual; one to adopt in real life. Day Five of Reading – I am a fan of culture and diversity and in this story, part of the focus is on India – their food, traditions, family dynamics and fashion; aspects neatly layered into the story, giving the tale freshness and interest. Day Six of Reading – This is a love story at its core. The story of a man and woman in love, who struggle to overcome major obstacles. Every love story is a human story, and “The Longest Nine Months” hits both notes – love and human. Day Seven of Reading – I once heard someone say that “authenticity is as necessary as air.” In this story, Campbell makes some pretty bold moves, but she is equipped to do so because she knows herself and makes moves based on her inner needs. For siding with authenticity, she is rewarded. Day Eight of Reading – One of my favorite scenes in this story is when the friends gather to share conversation and truth. How blessed we are when we have friends who speak truth and share wisdom. Day Nine of Reading – There’s a reason the story is titled “The Longest Nine Months.” It takes about that much time for Campbell to decide on motherhood and the next phase of her career. She didn’t rush her decision-making. She didn’t fall into desperation. She took her time and in the end, created the right life for her. Day Ten of Reading – Campbell certainly had her share of difficulties but she looked for the positives in her situations and found them. A reminder that a frown can be turned to a smile with the right attitude. Day Eleven of Reading – Through Campbell’s long nine month journey, I was reminded that endings and beginnings are connected. In Campbell’s case she experienced several endings that opened the door to beautiful beginnings. Just like in real life. Day Twelve of Reading – A satisfying ending. That’s what Carol, the author left me with. 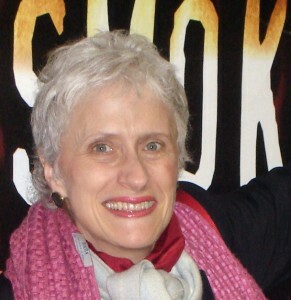 Carol is an expert at writing engrossing stories that are full of believable characters and challenging story situations. I am so happy to have discovered her line of books and I encourage you to buy “The Longest Nine Months” or any of the stories in her series. Until next time, have yourself a merry reading holiday! “Not by Design” is the latest offering from multi-published women’s fiction author Carol Balawyder. 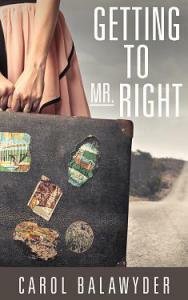 It is a sequel to “Getting to Mr. Right,” which you should read if you haven’t. “Getting to Mr. Right” is the story of four women who meet at a support group (the focus of which is women who have men/father issues) and form lasting, sincere friendships. “Not by Design” is Felicity Starr’s story. She is one of the women in the support group, and she has it all—looks, youth, a rich father, talent, true-heart friends and the love of a handsome, successful man. She is living a fairy tale life in France, studying art and pursuing a career in art, while enjoying an active social/love life. But even fairy tales are wrought with obstacles and that’s exactly what our heroine encounters—one setback after another. There’s the death of her father, a dwindling bank account which brings on financial woes, an art career that has stalled, and the painful decision to end her relationship with her fiancé and call off the wedding. But that’s not all. The biggest blow of all—a diagnosis of Multiple Sclerosis (MS). With all this dumped on her, Felicity makes the hard decision to release her dream of being an artist and living in France. She returns home to Canada to try and piece a life together. The move back home is met with more bitterness. She fights to recover her reputation in the work world. She has disagreements with her mother and step-mother. She gambles on several romantic interests and loses. And, she must make a slew of difficult choices in regard to her living arrangements and medical treatment, decisions made more difficult because of her limited funds. One wonders if Felicity will ever catch a break when…help arrives. At the strong suggestion of her doctor, she attends a MS support group meeting and finds the support and acceptance she so desperately needs. With the encouragement of the group, she shares her medical condition with her friends, who surround her with love, care and acceptance. The end of the story details the good life Felicity has finally secured. No, it’s not the one she would have designed for herself, but it works. She’s happy. This is a story that will take you low on the scale of human emotions and then pick you up. You will feel despair, then happiness; fear, then joy. This emotional seesaw is achieved in part by the story’s conflict—dreams and desire versus medical and financial worries, a situation many readers may relate to. I certainly did. And then there’s the overall story question: are we willing to release our version of our dream or life in exchange for an uncertain version? This is the question Felicity struggles with throughout the story but I dare say it is one many readers struggle with as well. There are many things to appreciate about this story. It is inspiring, well written and has relatable characters. But the one aspect I appreciated the most was the focus on MS. Reading about the symptoms, the various treatments, the expense, and how it requires life adjustments was a real education. Thank you Carol for that. I finished reading the book and shut down my e-reader thinking, I can’t wait to read the remaining sequel. The other three—“Café Paradise,” “Missi’s Dating Adventures” and “Not by Design”—have been purely enjoyable. Check ‘em out and see for yourself. 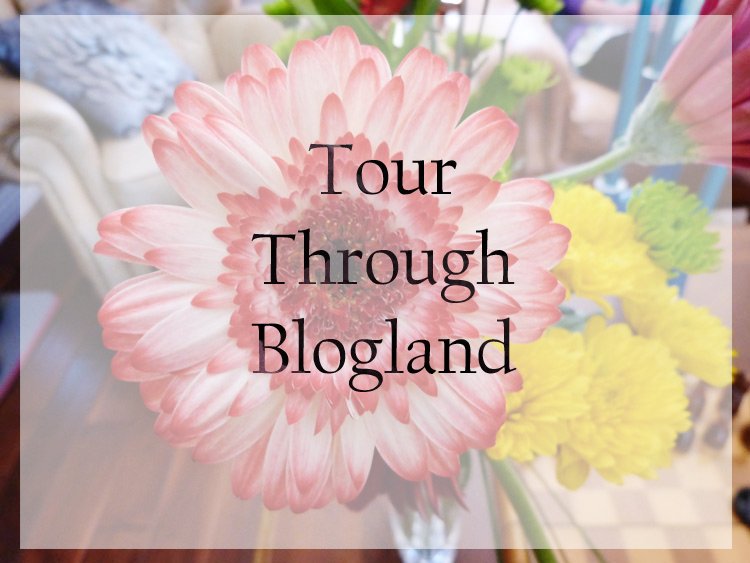 Thank you, Carol Balawyder for inviting me to be a part of the Tour through Blogland experience. Wow! What a pleasure to participate. The exposure to interesting blogs, writers and writings has been enormously enriching. Carol and I met, obviously through our blogging and in the year we’ve been online cohorts, I have discovered that she is a diverse writer with publishing credit in women’s fiction, memoir and crime writing, making her an accomplished fiction and non-fiction author. On top of her writing talents, she is also a welcoming and supportive person. I have enjoyed learning about her and her accomplishments, and I am so glad our blog paths crossed. I can’t wait for the day I meet her in person! I know it will be a blessing. Until then, I continue to enjoy her features on www.carolbalawyder.com and I hope you’ll take the time to link over and familiarize yourself with her and her latest works, Getting to Mr. Right and Missi’s Dating Adventures. I’ve read both of her books and found them to contain insightful commentary on some of today’s relationship issues…and not just romantic relationships. Her works are important and engaging and I think you’ll agree with me once you have read them. Thanks Carol for inviting me into your world and for your contributions to the literary world. Okay, simple enough; I can handle that. So without further delay, I present to you a blogger/author who I greatly admire and to whom I am passing the tour opportunity, followed by my responses to the creative process questions. I hope you enjoy! When I thought of all the bloggers with whom I could share this experience, Serena rose to the top. 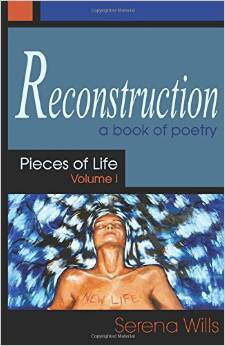 Not only because of her recently released poetry book, Reconstruction: Pieces of Life, Volume 1, A Poetry Book, but also because she is an amazingly productive, multi-faceted and inventive writer. Also, I settled on Serena because she lives her life as we all should: combining grit, faith and goal-nurturing to overcome adversity (that occasional blip that happens in every person’s life). 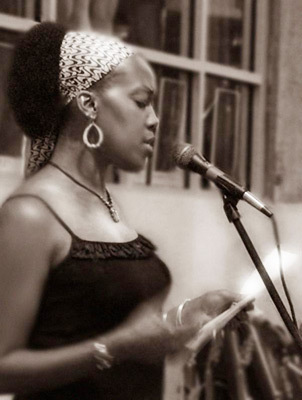 Read her poetry book and you’ll get a glimpse into the challenges she has had to overcome and how she overcame them. Click here to access her site, and we can all look forward to her Tour through Blogland post in April or May (set date to be communicated). What are you working on at the moment? My friend Renita likens the job of today’s writers to the juggling team of Vova and Olga, https://www.youtube.com/watch?v=ljnmYQ5NJjQ. Their job is to keep all of the balls, clubs or whatever they are juggling in the air. So, like Vova and Olga, I am juggling many items that include: a blog; a memoir; marketing and promotions for “Fuller’s Curse” and “Voices from the Block;” a non-fiction personal development book; a children’s book; the programming for a non-profit organization; and involvement in three writers groups. I try to work smart to keep all of these from crashing to the floor, but some days it’s a real struggle. Now, really, truth be told, what I should be working on is “Tremont’s Curse,” the sequel to “Fuller’s Curse,” but that’s an entirely different juggling act that is too exhausting to think about right now. How does my work differ from others in my genre? This is a tough one because I write in so many genres. “Fuller’s Curse” is a horror fiction novel. “Voices from the Block” features two mainstream short stories. And “The Devil Went Down to Georgia, Again” is a dark short story to be featured in an upcoming anthology (spring 2015). Plus, as I shared earlier, I have a children’s book in the illustration process, as well as a memoir and a sequel in the drafting stage. So I’ll lump all of my works together, strip away the genre classifications, and say that the main focus with many of my works is to blur boundaries and pummel perceptions in an effort to make people think about the labels we attach to people, places and things. I attempt in my writings to push readers beyond the obvious to see what else can be gleaned even if it makes them uncomfortable. Why do I write/create what I do? Stories, ideas, characters, questions, titles come to me and will not depart until I have locked them down on paper. I have had an idea for a play incubating in my head for 10+ years and yet I cannot remember what I ate for breakfast. So why do I write? Because I don’t have a choice. I have to write. Even before I was born, writing chose me and I choose to answer the call. Why do I write what I do? Because I am a creative who is fed by life experiences, and those life experiences translate into written works that take the shape of different genres and forms. How does my writing/creative process work? The creative process is as mysterious as the Bible so I’ll just respond to the writing process. As stated earlier, ideas, questions, titles, characters and such flow to me like city water through pipes. Idea generation is the easy part. What’s hard is committing words to paper: making myself sit down to write, anchoring myself to the chair, and creating the right string of words. So like other writers, I have learned tricks to make the writing process less strenuous. Like…ending a writing session at the height of dialogue or action; outlining the beginning, middle and end of a scene (I write scene by scene in linear order); reading a quote or inspirational piece at the start of a writing session; setting up a reward system for number of pages written, scenes completed, etc. ; capturing story notes on a separate document that I refer to when I’ve written myself into a corner; writing and editing the same scene a minimum of four times; making my final story edits the old school way (on paper with red ink); and mostly, praying a lot for help.